My name is Athena Pappas. 10/24/2008, my son Spyridon had a most serious accident. He was hit in the head, and had hemorrhage in his brain, dead cells which never regrow, and swelling in the center of his brain. He was in the ICU of N.N.A., and for 29 very difficult days he was in a coma, intubated, because he could not breathe, and he had begun internal sepsis in his organs. 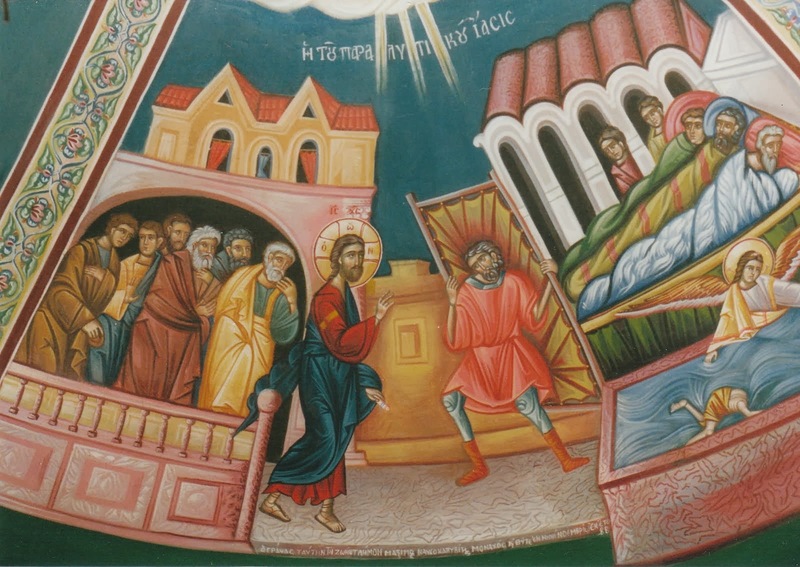 The culmination was the 45 minute [cardiac] arrest which occurred 3 days before the feast of Panagia (The Entrance to the Temple). After his arrest, his little heart suffered from insufficiency, which he would have for his whole life. My son was 16 years old when the accident occurred. We did not know what to ask God for. The doctors said that, if he would live, he would remain a vegetable because the trauma to the brain was in a place where information is processes. After the arrest, and while he was still in a coma, he continued to worsen. He did not breathe, his organs were not working, and from the blood they took they knew he had an infection, and a 40 degree [Celsius] fever. My husband and I entreated God either to raise him, because we did not know what to ask for first. The next day after the arrest, we had the Divine Liturgy served at St. Spyridon, the church which was in the yard of the hospital. The liturgy ended around 10AM. When they opened the visiting hours at 1PM, we learned that our spiritual father, Fr. 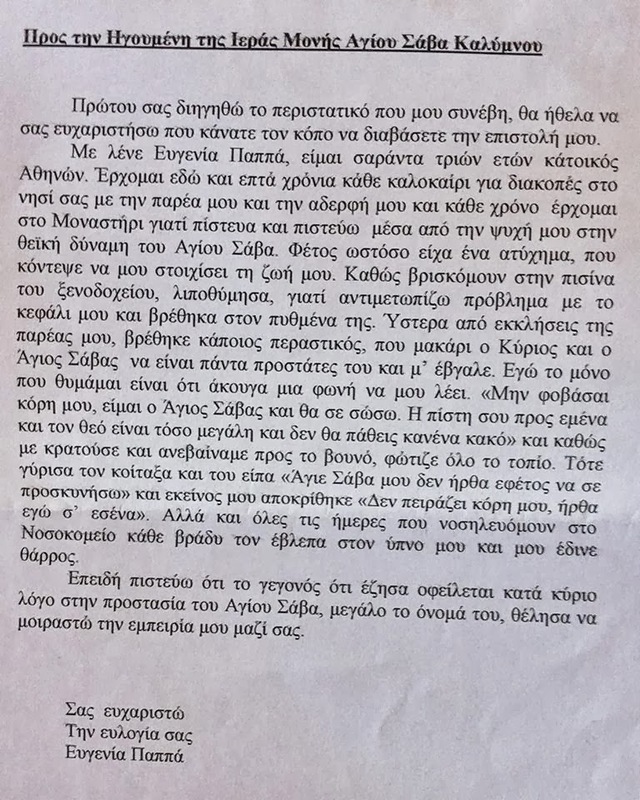 Stephanos Dalianes, had passed by and read to our child in the ICU, at the command of Fr. Paisios and Fr. Eumenios, who had previously reposed. We went into his room, and, O the wonder, the child from the neck and below was raised. His fever was 36.6 degrees, his kidneys were working properly, he had much urine and stool, and he was breathing on his own, without machines. Furthermore, his heart was working by itself, without machines. As soon as we set up the child in his room, again I began to cry and to fight with the others. I said: “Panagia is crying for my Spyro. Go and bring me her tears.” No one understood me, no one believed me. No one paid any attention... In roughly two hours, while we were washing my son, my cell phone rang. It was a friend of mine, who asked which hospital and which room we were at. As soon as she came, I asked her: “Did you bring me the tears of Panagia?” She looked at me, and said that her mother-in-law had gone to Oropos, but first she went to church to light a cande. 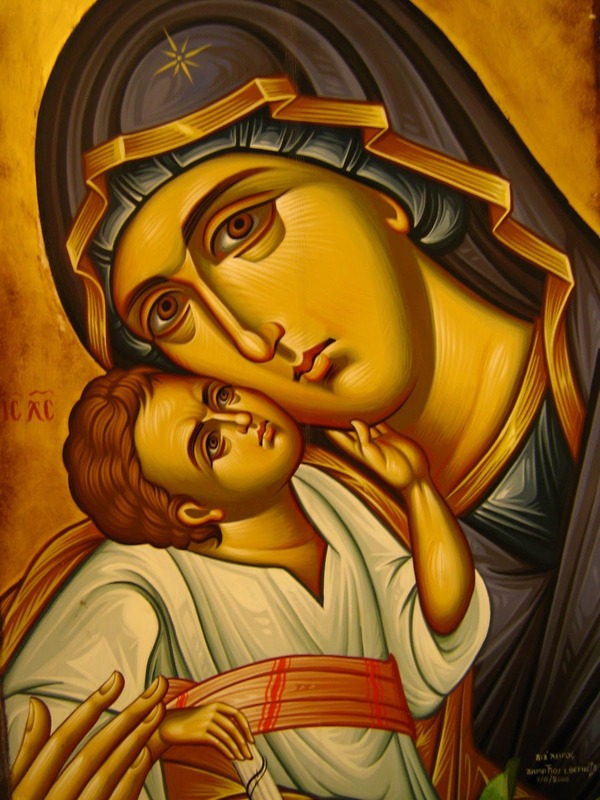 There she learned that the icon of Panagia gushes forth myrrh, and every year, on the feast of the Entrance of the Theotokos, they open the frame to take the myrrh. She took some myrrh for herself, and thought about me, and asked the priest for some for me. She gave it to her daughter-in-law to give it to me. Without a second thought, I took the myrrh from her hands, rolled it into the shape of a pill, and put it through the gastrostomy with the syringe. Then I calmed down, and was justified ultimately to my relatives. I should say furthermore that the cross that our spiritual father brought us to the ICU, and crossed our child with, turned red. Panagia covered our child, and so humble were the Saints who raised up our Spyro, and today, he is totally well. 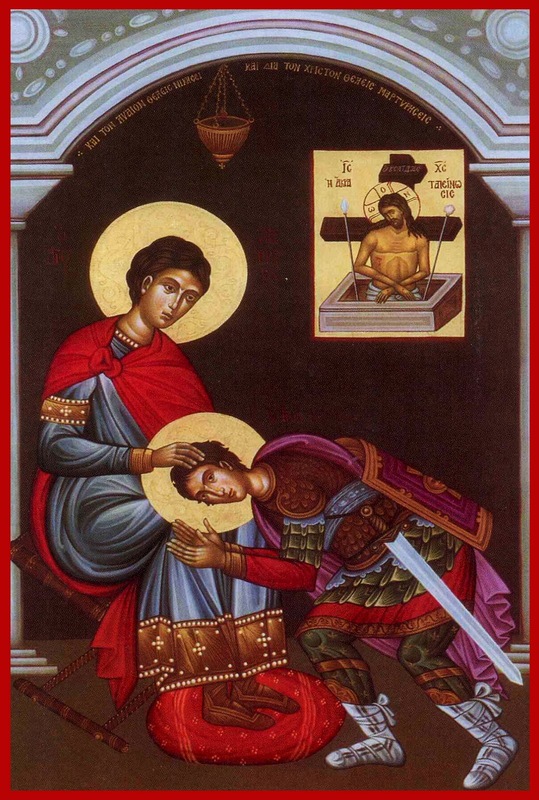 O Lord Jesus Christ our God, the Pre-eternal Word of God and the Father, Who through Your grace endowed endurance in the soul of the glorious Martyr Demetrios, to withstand manfully, in a body of clay, the great tortures of tyrants, on behalf of Your name, strengthen us also, we pray, that we may bravely endure the temptations brought about because of our sins, and all forms of dangers of the devil. And as You then scattered the schemes of the lawless through Your power, granting the ranks of the Angels, also now, through his intercessions, gladden our hearts, delivering us from this bitter tyrany that has been laid upon us, that we also, Your humble entreaters, may go forth with peace in life, and commemorate his annual memory, that we may be made worthy of Your mercy, for which You are well-pleased. For You are ever blessed, unto the ages of ages. Amen. "Why did God allow them to close and raze so many Churches in Russia?" "This was the will of God. The people are hypnotized, and a terrible demonic power has been put into action. It is in the air, and penetrates everything. Today, however, these homes and these very people have become dwelling places of demons because of their faithlessness and by their distancing themselves from Christ." St. John Maximovitch wrote: "Shake off the slumber of despondency and sloth, O sons of Russia! Behold the glory of her sufferings and cleanse yourselves; wash away your sins! Be strengthened in the Orthodox faith, to be worthy to dwell in the house of the Lord and to settle on His holy mountain! Leap up, leap up, rise up! 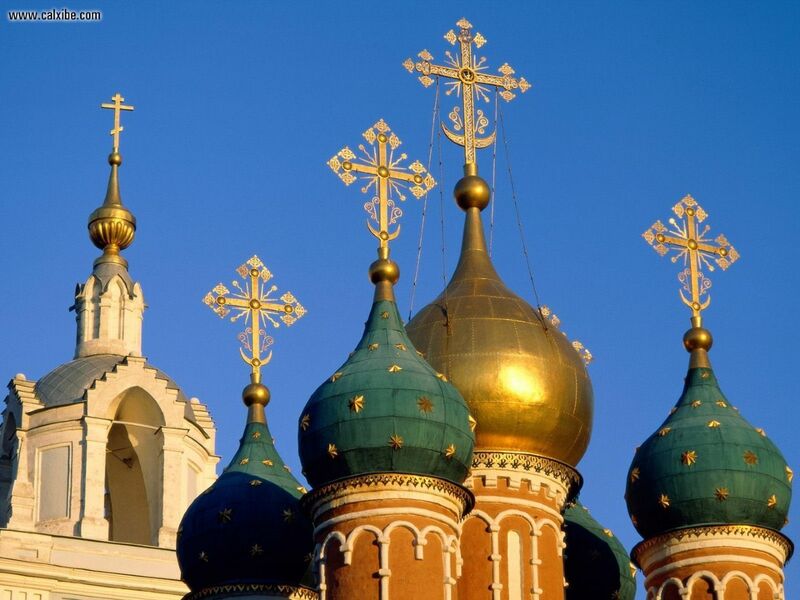 O Russia, you who from the Lord’s hands have drunk of the cup of His wrath! When your sufferings are over, your righteousness shall go with you and the glory of the Lord shall accompany you. The peoples shall come to your light, and kings to the radiance which shall rise on you. Then lift up your eyes and see: behold, your children come to you from the West and the North and the Sea and the East, blessing Christ in you for ever. Amen’ (The Orthodox Word, 1973, No. 50, pp. 94). 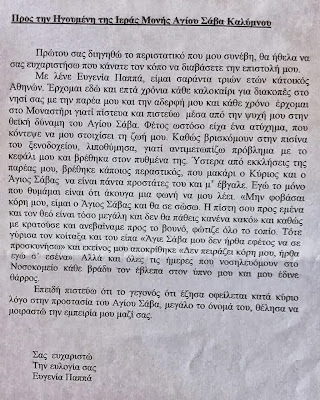 To the Abbess of the Holy Monastery of St. Savvas of Kalymnos. First of all, I wanted to relate the event that occurred with me, and I wanted to thank you for making the effort to read my letter. My name is Eugenia Pappas, and I am 43 years old, a resident of Athens. 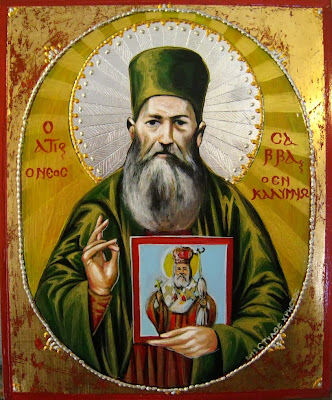 I have been coming here [to Kalymnos] every summer for seven years for vacation on your island together with my friend, and every year I come to the Monastery, because I believed, and I still believe within my soul, in the divine power of St. Savvas. This year, I had an accident that threatened my life. As I was in the pool at the hotel, I fainted, because I was facing a problem with my head, and I sank to the bottom of the pool. After my company was crying out, they found someone to help (thanks to the Lord and St. Savvas, and may they ever be his protectors), who pulled me out. The only thing that I remembered was that I heard a voice tell me: “Don't be afraid, my daughter, I am St. Savvas, and I will save you. Your faith in me and in God is great, and nothing bad will happen to you.” And as he was holding me, we ascended towards the mountain, and the whole area was filled with light. Then I turned around and told him: “My St. Savvas, I didn't come to you this year to venerate you.” And he replied: “It doesn't matter, my daughter; I came to you.” And all the days that I was in the Hospital, I would see him every night in my sleep, giving me courage. Because I believe that this event that I experienced will benefit others, due to the protection of St. Savvas (great is his name!) I wanted to share my experience with you. I ask of your blessing. Being banished from Paradise, Adam and Eve immediately began to thirst and hunger, to freeze and shiver, to have labors and sweat, and to endure all those difficulties and griefs that we even now endure. Therefore, they soon felt into what a bitter condition they had descended, and to what a great misfortune they had become subject. Then they realized both their own hardness of heart and their lack of repentance, as well as God's unutterable condescension and compassion towards them. Therefore, even walking and sitting outside Paradise, they repented and shed tears, beat themselves in the face and tore out the hair of their head, lamenting over their former hardness of heart. And this they did not for one day or two, or for ten days, but for their whole lifetime. For how can one not weep, remembering their meek and condescending Master, that unutterable delight of Paradise, those indescribable good things and beauties of the flowers of Paradise, that care-free life without labor, and that communion with angels? In worldly life, when servants are appointed by an eminent master in order to serve him, as long as they preserve attention, respect, and obedience towards their lord they have boldness before him, enjoy his favor and love, and live with him in peace and satisfaction. But when they become proud and begin to step away from the will of their master and despise their fellow servants, they lose not only their boldness before him, but even his favor and love; and at his order they are banished into a far country where they are subjected to innumerable necessities and sorrows, and the more they suffer and are in misfortunes, the more they feel the bitterness of their condition, remembering the peaceful and satisfied life that they have lost. This same thing was experienced by our first ancestors also, who lived in Paradise and took sweet delight in its great good things. They acknowledged the greatness and value of these good things after they had lost them, being banished from Paradise; then they recognized also the whole greatness of the evil which they had done. Therefore they ceaselessly grieved and wept, calling on God's compassion. And what did God do, being quick and ready to mercy, and slow to punishment? He foresaw that they would finally become humble and repent, and therefore He foreordained a special means for abolishing His righteous sentence upon them. But, He did not immediately bring into execution this foreordained decree, but assigned for this His own place and time and fashion, so as to teach us to love wisdom and not to rise up against our Creator and God. Just as He foreordained, so later did He do: for those whom He banished from Paradise for their brazenness before Him and their unrepentant heart, since they had humbled themselves and wept over themselves, He arranged a way for the restoration of what had been lost. And this is what it was: The Only-begotten Son and Word of the Unoriginate Father descended from the heavens to earth, and not only became man like them, but even was pleased to endure a violent and shameful death; then He descended into hades, brought them up from there and restored them. And thus, since Christ so suffered for them, as you hear every day, that He returned them from such a distant exile, would He not have had pity on them, if they had repented then in Paradise? How could he not have had pity on them, when He by nature is the Lover of mankind and compassionate, and He created them in order that they might take sweet delight of the good things of Paradise and might glorify their Benefactor? But so that you might the better understand this and believe my words, hear yet more: If they had repented then, when they were still in Paradise, they would have received again only Paradise and nothing more. But inasmuch as, being banished from Paradise for their lack of repentance, they then repented, wept much and were in great misfortunes, therefore God the Master of all, for their labors and sweat, for the misfortunes which they endured and for their good repentance, was pleased again to honor them and to glorify them so as to cause them to forget the whole evil that they had caused. And what did He do? Behold how great is God's Love of mankind! Descending to hades and bringing them out, He did not bring them again into the same Paradise from which they had been banished, but He raised them up to the heaven of heavens; and when He sat down at the right hand of His God and Father, He sat them down together with Him. Just think what great honor He gave to Adam who by nature was His slave, and vouchsafed him to be God's own father according to His grace-given dispensation. See to what a height our Master Christ raised him up for his repentance, humility, lamentation and tears! O the power of repentance and tears! O the ocean of Love of mankind which is beyond words, and mercy which cannot be traced out! And not only Adam did God honor and glorify, but also us his sons--those, that is, who have begun to please him by repentance, tears, lamentation and by all of which we have spoken; and even up to now He glorifies and honors like Adam those who repent well and do what Adam did. Further, those who up until now and in the future will do this and repent, whether they be laymen or monks, He will glorify like Adam, as He Himself, our true God, has said: Truly I say to you, I will not leave them ever, but show them to be My brethren and friends, fathers and mothers, kinsmen and co-inheritors. I have glorified them and will glorify them, both in the heavens on high and on the earth below; and of their life and rejoicing and glory there shall be no end. Tell me, then, my brother: What profit was there for our first ancestors in that laborless and carefree life which they had in Paradise, when they were careless, disdained God by not believing Him, and transgressed His commandment? For if they had believed Him, Eve would not have considered the serpent to be more trustworthy than God, Adam would not have believed Eve rather than God, and they would have refrained from eating of the forbidden tree. But they ate and did not repent, and for this they were banished from Paradise. Moreover, from banishment also they received no harm, but great benefit. This is by power of the dispensation of our salvation. For our Master Christ descended from the heavens, by His death loosed the bonds of our death, and took away the condemnation that came down to us from the transgression of our first parents; by the power of holy Baptism He regenerated us, recreated us and delivered us from every condemnation and made us in this world completely free, so that our enemy the devil might no longer act in us and against us by violence and force. He honored us with the same autonomy which was given us in the beginning, and He gave us more power against the enemy than all the saints had who lived before the dispensation of Christ, so that those who desire might easily conquer the enemy. 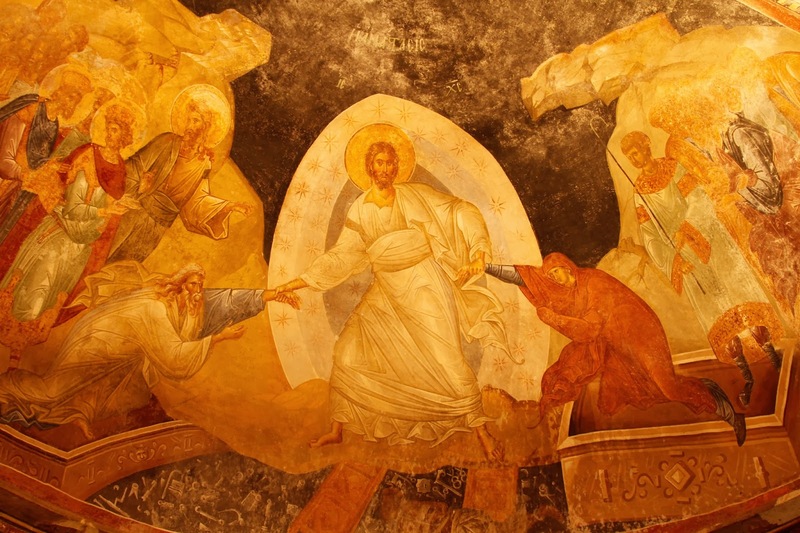 And when such ones die they do not descend to hades like the ancients, but ascend to the heavens and are vouchsafed to receive the repose and eternal joy which are there--only to a certain degree at the present time, but completely and entirely after the resurrection. And so let no one invent excuses for his sins and say that we, by virtue of the transgression of Adam, are entirely subject to the action of the devil and are dragged by force into sin. They who think and speak thus consider that the dispensation of the Incarnation of our Master and Savior Jesus Christ was useless and in vain. Such an opinion is the opinion of heretics and not of the Orthodox. For what other reason did Christ descend and become Incarnate, and for what else did He suffer if not in order to loose the condemnation which proceeded from sin, and to deliver our race from slavery to the devil and from the activity in us of this our enemy? This is true autonomy: in no way to be subject to someone else. We are all born sinners from our forefather Adam who sinned; we are all criminals from a criminal, slaves of sin from a slave of sin, subject to the curse and death from him who was subject to the curse and death. And because of Adam who received the action of the cunning devil, and by his counsel was moved to sin, and enslaved himself to him and lost his autonomy--we also, as his children, are subject to the action and the compulsory dominion of the devil and are his slaves. But our Lord came down from the heavens, was Incarnate and became man like us in everything except sin, in order to annihilate sin. He was conceived and born so as to sanctify the conception and birth of men. He was raised up and grew little by little so as to bless every age of life. He began to preach at the age of thirty, having become a full-grown man, so as to teach us not to jump out of line and go before those who are greater than us in mind and virtue, that is, are more intelligent and virtuous than we, especially if we are still young and not perfect in understanding and virtue. He preserved all the commandments of His God and Father so as to loose every transgression and to deliver us criminals from condemnation. He became a slave, took the form of a slave, in order to raise us, the slaves of the devil, once more into the condition of masters and to make us masters and possessors over the devil himself, our former tyrant. (This is confirmed by the saints who have cast out the devil, as a weak and infirm one, as well as his servants, not only in their lifetime but also after their death.). He was hung upon a Cross and became a curse, as the prophet says: Cursed is everyone that hangeth upon a tree (Deut. 21:23), in order to loose the whole curse of Adam. He died in order to put death to death, and He rose in order to annihilate the power and activity of the devil who had authority over us by means of death and sin. Thus out Lord, having cast into the midst of the death-dealing poison of sin the unutterable and life-giving activity of His Divinity and His Flesh, has liberated our race from the working of the devil; and purifying us by holy Baptism and bringing us to life by the communion of the most pure Mysteries of His precious Body and Blood, He makes us holy and sinless. But He then leaves us again to have autonomy, so that it might not seem that we serve our Master by compulsion, but rather by our own free will. Therefore, as in the beginning Adam in Paradise was free and sinless, and by his free will obeyed the enemy, was deceived and transgressed the commandment of God--so on the contrary we, being regenerated by holy Baptism, delivered from slavery and becoming free, if we do not obey by our own free will our enemy the devil, this cunning one will in no way be able to place in us any kind of evil. 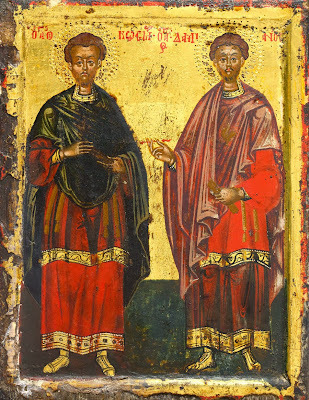 Now, before the law and the coming of Christ, without the aid of those means of which we have spoken, many and very many pleased God and manifested themselves as irreproachable; among their number the righteous Enoch was honored by God by being translated, and Elias was raised to heaven in a fiery chariot. Therefore, what kind of justification can we give, if after the manifestation of grace, after such and so great benefactions, after the annihilation of death and sin, we do nor manifest ourselves as holy; if after being regenerated by the holy Baptism which we have received, standing under the protection of the holy angels by whom we are surrounded, and under the action of the grace of the Holy Spirit which we have been vouchsafed to receive--we do not become even like those who were before grace, that is, before Christ, but we remain in carelessness, and disdain and transgress the commandments of God? And that we, if we are careless about our salvation, will be punished more than those who sinned before Christ, the Apostle Paul indicates when he says: If the word spoken through angels proved steadfast, and every transgression and disobedience received a just recompense of reward, how shall we escape, if we neglect so great a salvation (Hebrews 2:2-3). And thus, each one of us, no matter what transgression he might have fallen into--let him not accuse Adam, but let him reproach himself. And let him show true and worthy repentance like Adam, if he desires to be vouchsafed the Kingdom of Heaven. Amen. When you see your body wasted through sickness, do not murmur against God, but say: "The Lord gave, and the Lord hath taken away; blessed be the name of the Lord." You are accustomed to look upon your body as upon your own inalienable property, but that is quite wrong, because your body is God's edifice. If it falls to you to have to bear great misfortunes, sorrows, and sicknesses, do not grow faint-hearted or despondent; do not murmur; do not desire death for yourself; and do not speak audaciously before the all-seeing God — as, for instance: "O, what a cruel affliction! " "O, what an unbearable misfortune; let me rather die!" or "I would rather kill myself!" God save you from such faint-heartedness, murmuring, and audacity! But endure all this courageously, as having been sent to you from God for your sins; repeat with the wise malefactor, "We receive the due reward of our deeds," and contemplate with your mental eyes the Saviour suffering on the cross. You are ill, and your illness is very painful; you have become low-spirited and despondent; you are troubled and tossed with thoughts, each darker than the other; your heart and your lips are ready to murmur, to blaspheme God! My brother! listen to my sincere advice. Bear your illness bravely, and do not merely not despond, but on the contrary, rejoice, if you can, in your illness. You would ask me what there is for you to rejoice at when you are racked all over with pain? Rejoice that the Lord has sent you this temporary chastisement in order to cleanse your soul from sins. " For whom the Lord loveth He chasteneth." Rejoice in the fact that now you are not gratifying those passions which you would have gratified had you been in good health; rejoice that you are bearing the cross of sickness, and that therefore you are treading the narrow and sorrowful way leading to the kingdom of heaven. Maladies in our eyes only appear painful, unpleasant, and terrible. It is seldom that any one of us during the time of sickness represents to himself the profit which his illness brings to his soul; but in God's all wise and most merciful Providence, not a single malady remains without some profit to our soul. Sicknesses in the hands of Providence are the same as bitter medicines for our soul, curing its passions, its bad habits and inclinations. Not a single malady sent to us shall return void. Therefore, we must keep in view the utility of sicknesses, in order that we may bear them more easily and more calmly. "He that hath suffered in the flesh hath ceased from sin,"  says the Holy Scripture. When your spirit is dejected during sickness, and begins to represent to you the terrors of death, then tranquilize and comfort your troubled, trembling, and sorrowful heart by the following words: "Thou, O Lord, in the depths of Thy wisdom and love to men, orderest everything and givest unto all everything that is profitable for them," and believe that He will unfailingly order everything for your good, whether it be life, sickness, misfortune, sorrow, or death, so that you could not even desire better. Do not say: "It is early for me to die. I would have wished to live a little longer for the glory of God for the advantage of my relatives and neighbours. I should have liked to look a little longer upon the world, to enjoy earthly blessings." Be thankful to God for having enjoyed up till now His blessings, favours, and bounties. Now submit to His will, to His call, but at the same time do not despair of the continuation of your earthly life. If a human physician can sometimes bring back to life a half-dead person by means of the knowledge of his profession, and skilful, well-directed action upon the cause of the illness, cannot, therefore, the Creator of physicians and of the science of healing cure, at His single wish and word, every illness? Cannot the Creator even raise the dead at His single word? Let us render glory to Him, we of little faith, and let us say to Him from our hearts: "All things are possible unto Thee, Lord, and nothing is impossible to Thee. Amen." By striking our bodily structure with sickness, the Lord crushes the old, sinful, carnal man, in order to give strength to the new man, whom we have weakened by the works of the flesh: gluttony, slothfulness, amusements, and manifold sinful attachments and passions. "For when I am weak, then am I strong." Therefore, we must accept every malady with gratitude. When you are asked to pray that someone may be saved from bodily death, for instance, from drowning, from death through any sickness, from fire, or from any other disaster, commend the faith of those who ask you to do so, and say in yourself: Blessed be your faith, according to your faith may the Lord fulfill my unworthy, feeble prayer, and may He increase my faith. When the Lord strikes you with sore affliction or sickness, or misfortune, then be assured that He will also truly send you consolation, and will afterwards bestow upon you the grace of peace, strength, and joy corresponding to your previous sufferings. For "the Lord is merciful and gracious, slow to anger, and plenteous in mercy. He will not always chide, neither will He keep his anger for ever. He hath not dealt with us after our sins; nor rewarded us according to our iniquities." All sorrows, sicknesses, torments, deprivations, are allowed by God in order to drive out the enticement of sin, and to implant true virtue in the heart, that we may learn by experience the falsehood, insolence, tyranny, and deadliness of sin, and may be inspired with a loathing for it; also that we may learn by experience the truth of meekness, wisdom, of gently ruling the hearts of men, and of the life-giving properties of virtue. Therefore, I will bear all afflictions courageously, with gratitude to the Lord, the Physician of our souls, our Most-loving Saviour. You ask the Lord that you may love Him with a love, strong as death, or until death. Suppose, now, that the Lord sends you a terrible inward disease that may bring you nigh unto death itself. Do not, then, murmur against the Lord, but bear it bravely, thanking the Lord for His fatherly visitation, and this will show that what you call your love for God is strong as death. And during the most violent fits or spasms of your illness trust in God, that He has the power to save you, not only from suffering, but even from death itself, should it please Him to do so. Do not spare, do not cherish your perishable body, but give it up willingly and wholly to the Lord, as Abraham gave his son Isaac as an holocaust, to the will of the Lord Who punishes you — not losing faith in God's goodness, not growing despondent, not foolishly accusing God of injustice for so severely chastising you — and you will thus offer a great sacrifice unto God, like Abraham or like the martyrs. In sickness and, in general, during bodily infirmity, as well as in affliction, a man cannot in the beginning burn with faith and love for God, because in affliction and sickness the heart aches, whilst faith and love require a sound heart, a calm heart. This is why we must not very much grieve if during sickness and affliction we cannot believe in God, love Him, and pray to Him fervently as we ought to. Everything has its proper time. I marvel at the greatness and life-giving properties of the Holy Sacrament. An old woman who was spitting blood, and who had lost all strength, being unable to eat anything, after the Communion of the Holy Sacrament, which I administered to her, began to recover on the same day from her illness. A young girl who was almost dying, after the Communion of the Holy Sacrament began to recover on the same day from her illness; began to eat, drink, and speak; whilst before this she was almost in a state of unconsciousness, violently tossed about, and could neither eat nor drink anything. Glory to Thy life-giving and terrible Mysteries, O Lord! When you are granted recovery from any illness, render thanks to God in the following short form of praise: — Glory to Thee, Lord, Jesus Christ, the only begotten Son of the everlasting Father, Who alone art able to heal all manner of sickness and disease in men, that Thou hast had mercy upon me, a sinner, and hast delivered me from my sickness, not allowing it to develop and slay me according to my sins. Grant to me, from this time forth, Master, strength to firmly fulfil Thy will, to the salvation of my accursed soul, and to Thy glory, and that of Thy everlasting Father, and of Thy consubstantial Spirit, both now and for ever, and to ages of ages. Amen. When your flesh suffers through maladies, remember that it is the greatest enemy of your salvation that suffers, that is weakened by these sufferings, and bear them bravely in the name of the Lord Jesus Christ, Who for our sakes endured the cross and suffered death; also, remember that all our maladies are God's punishment for sins; they cleanse us, they reconcile us with God and lead us back to His love. Grant us "Thy peace," it is said, "and Thy love, as Thou hast granted us all things." Remember, that during your illness the Lord Himself is with you ("I am with him in trouble"); that it has proceeded from a sign of the Master, punishing us as a father. You who believe in the time of your welfare, see that you do not fall away from God in the time of misfortune, but, like the martyrs, be constant in faith, hope, and love. "Make us glad according to the days wherein Thou hast afflicted us, and the years wherein we have seen evil." The merciful Lord, having punished us, forgives us afterwards by His temporal and eternal mercy. Sometimes a sick person suffers a long while from his malady, as from a wicked tyrant; but during this malady his soul is purified like gold; he obtains the freedom of God's children, and is deemed worthy of eternal peace and blessedness. Do not despond in the time of violent temptations, afflictions, or sicknesses, or at obstacles arising from the disturbance of the enemy; all this is the reproof and chastisement of the righteous Lord, Who trieth the hearts and reins, for your cleansing, arousing, and correction, for burning out the thorns of carnal passions. And therefore do not complain if you sometimes suffer greatly. Do not think of the suffering, but of the blessed consequences of this chastisement, and the health of the soul. What would you not do for the health of your body? Still more must you bear everything for the health and salvation of your soul, which has eternal life. It is never so difficult to say from the heart, "Thy Will be done, Father," as when we are in sore affliction or grievous sickness, and especially when we are subjected to the injustice of men, or the assaults and wiles of the enemy. It is also difficult to say from the heart "Thy Will be done" when we ourselves were the cause of some misfortune, for then we think that it is not God's Will, but our own will, that has placed us in such a position, although nothing can happen without the Will of God. In general, it is difficult to sincerely believe that it is the Will of God that we should suffer, when the heart knows both by faith and experience that God is our blessedness; and therefore it is difficult to say in misfortune, "Thy Will be done." We think, "Is it possible that this is the Will of God? Why does God torment us? Why are others quiet and happy? What have we done? Will there be an end to our torments? " And so on. But when it is difficult for our corrupt nature to acknowledge the Will of God over us, that Will of God without which nothing happens, and to humbly submit to it, then is the very time for us to humbly submit to this Will, and to offer to the Lord our most precious sacrifice — that is, heartfelt devotion to Him, not only in the time of ease and happiness, but also in suffering and misfortune; it is then that we must submit our vain erring wisdom to the perfect Wisdom of God, for our thoughts are as far from the thoughts of God "as the heavens are higher than the earth." Do not fear the conflict, and do not flee from it: where there is no struggle, there is no virtue; where there are no temptations for faithfulness and love, it is uncertain whether there is really any faithfulness and love for the Lord. Our faith, trust, and love are proved and revealed in adversities, that is, in difficult and grievous outward and inward circumstances, during sickness, sorrow, and privations. Lord, how shall I glorify Thee? How shall I praise Thee for Thy power, for the miracles of healing by means of Thy Holy Mysteries, manifested upon me and many of Thy servants, to whom I, an unworthy one, have administered these Thy holy, heavenly, life-giving Mysteries after the sacrament of penitence. They confess before me Thy power, Thy goodness, loudly proclaiming to all that Thou hast stretched out Thy wonderworking hand over them and raised them up from the bed of sickness, from their death-bed, when no one expected that they would live; and then, after the communion of Thy life-giving Body and Blood, they soon revived, were healed, and felt upon them at the very same hour and day Thy life-giving Hand. And I, Lord, the witness of Thy deeds, have not hitherto praised Thee in the hearing of all for the strengthening of the faith of Thy servants, and even do not know how and when to praise Thee, for every day I am occupied with some kind of work. Create Thyself a name, Lord, as Thou hast done; glorify Thyself, Thy name, Thy Mysteries. When you pray, say in your heart, against the various thoughts and provocations that come from the enemy: " The Lord is everything to me." Likewise, during all your life, when passions attack you, and during every oppression of the enemy, and during sickness, afflictions, misfortunes, and disasters, say: "The Lord is everything to me; I myself can do nothing — cannot bear anything, cannot surmount, conquer anything — He is my strength." A certain person who was sick unto death from inflammation of the bowels for nine days, without having obtained the slightest relief from medical aid, as soon as he had communicated of the Holy Sacrament, upon the morning of the ninth day, regained his health, and rose from his bed of sickness in the evening of the same day. He received the Holy Communion with firm faith. I prayed to the Lord to cure him. "Lord," said I, "heal Thy servant of his sickness. He is worthy, therefore grant him this. He loves Thy priests, and sends them his gifts." I also prayed for him in church before the altar of the Lord, at the Liturgy, during the prayer: "Thou Who hast given us grace at this time, with one accord to make our common supplication unto Thee," and before the most Holy Mysteries themselves. I prayed in the following words: "Lord, our life! It is as easy for Thee to cure every malady as it is for me to think of healing. It is as easy for Thee to raise every man from the dead as it is for me to think of the possibility of the resurrection from the dead. Cure, then, Thy servant Basil of his cruel malady, and do not let him die; do not let his wife and children be given up to weeping." And the Lord graciously heard, and had mercy upon him, although he was within a hair's-breadth of death. Glory to Thine omnipotence and mercy, that Thou, Lord, hast vouchsafed to hear me! I recognise, I feel clearly, that I receive help through the names of those saints upon whom I have called, because of my lively faith in them. This happens just as everything happens in the usual order of earthly things. First, I see my helpers by means of earnest faith; then, seeing them, I pray to them also with my whole heart, invisibly but intelligibly to myself; after this, having received invisible help in quite an imperceptible manner, but sensibly to my soul, I simultaneously receive a strong conviction that this help has been obtained from them, just as a sick man, cured by a doctor, is convinced that he has been cured precisely by that doctor, and not by anyone else; that his illness has passed away not by itself, but through the help of this particular doctor. All this comes to pass so simply that it is only necessary to have eyes in order to see. As quickly as the pleasure of eating and drinking passes away in those sitting at table dining, for instance, so quickly shall pass, and passes away the present life, with all its pleasures, joys, sorrows, and sickness. It is like morning dew, vanishing at the appearance of the sun. Therefore the Christian, who is called to a heavenly country, who is only a stranger and a sojourner upon earth, ought not attach his heart to anything earthly, but should cling to God alone, the Source of life, our resurrection, and the Life eternal. Give yourself up entirely to God's providence, to the Lord's Will, and do not grieve at losing anything material, nor in general at the loss of visible things; do not rejoice at gain, but let your only and constant joy be to win the Lord Himself. Trust entirely in Him: He knows how to lead you safely through this present life, and to bring you to Himself — into His eternal Kingdom. From want of trust in God's providence many and great afflictions proceed: despondency, murmurings, envy... We, as Christians, as "fellow citizens with the Saints and of the household of God,"  ought to commit all our life, together with all its sorrows, sicknesses, griefs, joys, scarcities and abundance unto Christ our God. Always remember that your neighbour, whoever he may be, if he is a Christian, is a member of Christ, though he may be a sick one, but then you yourself are also sick, and you must always receive him with respect and love, converse with him heartily, entertain him, and not grudge him anything: neither food, drink, clothes, books, nor money, if he has need of them. The Lord will reward you for him. We are all His children, and He is — everything to us. We are all sinners, and "the wages of sin are — misfortunes, troubles, sorrow and sickness, and — "death." In order to be saved from sin, we must pray; and in order to pray, we must have faith and hope. Thus for us sinners, prayer, faith and hope, are most necessary. Prayer ought not to cease coming from the mental, and even from the outward lips of a sinner. You know that eternal life in God is promised you, that you must earn it by obedience to God and His Church during this transitory life, by patience in sickness, sorrows, misfortunes and various privations — and yet you do not wish to obey the Creator, you live in carelessness and neglect of your souls, in neglect of virtue, in continual sin! What can you expect after this, ungrateful, evil-natured, and disobedient creatures? My soul, think and direct all your earthly life to the glory of God and the good of your neighbour. Do not gratify flesh and blood, but seek to please your Lord; for flesh and — blood are — perishable like all earthly things. Be especially meek and patient in sickness and in other various unfavourable circumstances; for, spoiled by health, plenty, happiness, and peace, we are then particularly apt to become irritable. Happy are those of us who do not passionately attach themselves to anything, for they are not bound by avarice. Bear with humble submission to the will of God every sorrow, every sickness and infirmity, every labour, every offence and disappointment, saying: "Thy Will be done,"  knowing that God's mercy orders everything for your good, and that the Lord can easily change every disappointment into happiness and joy. During the life of the Christian there are hours of inconsolable sorrow and sickness, when it seems that the Lord has completely abandoned and forsaken him, for there is not the least feeling of God's presence in the soul. Such hours are the hours of the temptation of the faith, hope, love, and patience of the Christian. "But better times shall soon come for him, and He shall send Jesus Christ, Which before was preached unto you." Soon the Lord will again rejoice him, so let him not fall under temptation. The mode of curing spiritual sicknesses (the passions) entirely differs from the mode of curing of bodily sicknesses. In the latter case, attention must be fixed upon the malady; the tender part must be treated by softening means — warm water, compresses, and so forth. But it is not so in the case of spiritual sicknesses; so if you have fallen spiritually sick, do not pay attention to it, but strike the malady, crucify it; do not in any wise indulge it, do not cherish it, do not warm it, do quite the reverse to that which it asks you to do. If you feel hatred for your neighbour, crucify this passion quickly, and immediately begin to love your neighbour; if you have fallen into avarice, try to quickly become generous; if you have grown" envious, try to quickly become benevolent; if you have fallen into pride, quickly humble yourself to the ground; if you have fallen into covetousness, praise those who are disinterested, and endeavour to become like them; if you are tormented by the spirit of enmity, strive after peace and love; if you are overcome by gluttony, quickly strive to be abstinent and keep fast. The whole art of curing the diseases of the spirit consists in not paying attention to them, and in not in the least indulging them, but in immediately cutting them off. It was through the eating of the forbidden fruit in Paradise that mankind acquired the cruel sickness of the soul, attachment to this transitory life, to earthly blessings and pleasures, that most destructive division of the heart between God and the world, between good and evil. It is a remarkable phenomenon in nature that, if you put a plant into a large, wide pot or tub, it grows very much at the roots; they thicken, they give out many ramifications, but the tree itself does not grow much in height, and only yields few and small leaves and flowers. But if it is planted in a small pot, then the roots are small, but the plant itself grows rapidly in height and yields beautiful leaves and flowers (if it is the nature of the plant to produce flowers). Is it not the same with man? When he lives in full liberty, in abundance and prosperity, then he grows in body and does not grow in spirit, does not bring forth fruits — good works; whilst when he lives in straightness, in poverty, sickness, misfortune, and afflictions, in a word, when his animal nature is crushed, then he grows spiritually, bears flowers of virtue, ripens and brings forth rich fruits. This is why the path of those who love God is a narrow one. What is holiness? Freedom from every sin and the fulness of every virtue. This freedom from sin and this virtuous life are only attained by a few zealous persons, and that not suddenly, but gradually, by prolonged and manifold sorrows, sicknesses, and labours, by fasting, vigilance, prayer, and that not by their own strength, but by the grace of Christ. Do not confound man — that image of God — with the wickedness that is in him, because the wickedness is only accidental, his misfortune, sickness, an illusion of the Devil; but his being — the image of God — still remains in him. If the carnal man is at ease and happy, the spiritual one feels oppressed; if the outward man flourishes, the inward one perishes. So opposite in us are the old, sinful, carnal man and the man renewed by Christ's grace; this is why the Apostle said, "Though our outward man perish, yet the inward man is renewed day by day." And we often experience this ourselves. Therefore the true Christian ought to long for outward, carnal, worldly sufferings, for they strengthen his spirit. He must not even think of murmuring. How can he murmur at that which is profitable to his immortal soul, although the means by which this is attained are very repugnant to his carnal man? Illnesses, fires, robbery, poverty, misfortunes, wars, famine, often act beneficially upon the soul. One meets with distorted hearts in some men. At the celebration of the sacraments they breathe unbelief and insensibility, moral impotency or mockery, disturbance, and diabolical fear! During the illness of those near to them one is also struck by their insensibility and even diabolical malignancy. They consider their sick brother as superfluous in the world, and inwardly think "There will be more room for me if he dies," not reflecting that every man — and they themselves — may perhaps die to-morrow, and not pitying the sufferer in their hearts as their own member. As God is Life, and diseases and maladies are a deviation from life, therefore the touch alone of the first Source of Life cures us of them. This is why the Saviour, Who is the Life of all, cured and still cures men by His touch alone. The same may be said of the change in any contagious objects — at a single sign or single word of the Creator and Founder of everything, they become harmless (air, water, plants and animals). When your faith in the Lord, either during your life and prosperity, or in the time of sickness and at the moment of quitting this life, grows weak, grows dim from worldly vanity or through illness, and from the terrors and darkness of death, then look with the mental eyes of your heart upon the companies of our forefathers, the patriarchs, prophets, and righteous ones — St. Simeon, who took the Lord up in his arms, Job, Anna the Prophetess, and others; the Apostles, prelates, venerable Fathers, martyrs, the disinterested, the righteous, and all the saints. See how, both during their earthly life and at the time of their departure from this life, they unceasingly looked to God and died in the hope of the resurrection and of the life eternal, and strive to imitate them. These living examples, which are so numerous, are capable to strengthen the wavering faith of every Christian in the Lord and in the future life. Those Christian communions who do not venerate the saints and do not call upon them in prayer lose much in piety and in Christian hope. They deprive themselves of the great strengthening of their faith by the examples of men like unto themselves. St. Matthew vi. 10; St. Luke xi. 2.